Everyone loves stocking stuffers. Get some cute little trinkets at Paradiso that are a perfect for a stockings! Take a look at some of our favorite holiday gifts! Bundle them together for up to 15% off total value! Let's just throw it out there, you're never too old to write your own Christmas wish list. This year you can come in and create your very own at Paradiso. How it works? 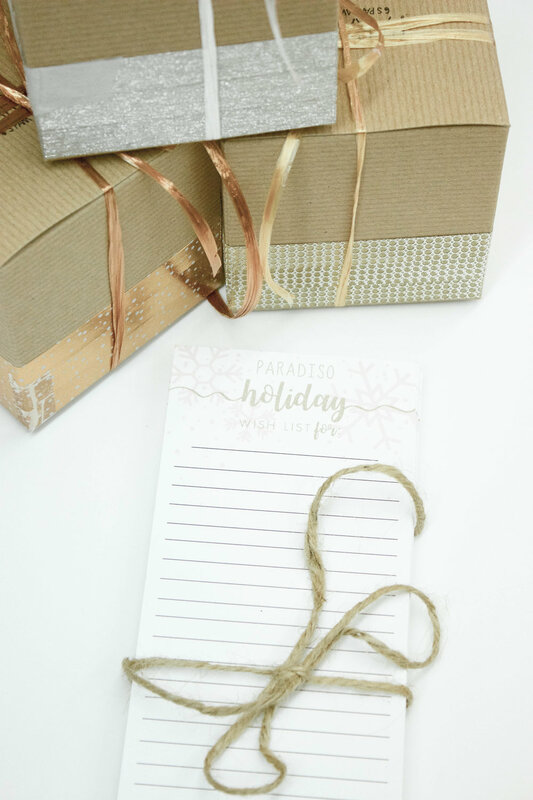 Stop in Paradiso, ask one of our stylists for a wish list sheet and make sure to jot down all your favorites you want Santa to bring you. Just make sure to leave it with your stylist before you with your first and last name! Whoever it is that may come to shop for you can just ask for your wish list and simply shop away. It's here! The behind the scenes preview from our Holiday Campaign: Celebrate You look book photoshoot!!! A HUGE thank you to all these incredible women yesterday who joined us in our Holiday Campaign: Celebrate You photoshoot!! Paradiso is for women from all walks of life and these women are the proof! They are all intelligent, beautiful and strong but most importantly they are all special in their own way! Follow along for some behind the scenes and the final look book!!! They really worked it!!! Stop by this fall season! Check out our Paradiso In Fall commercial on our YouTube channel now! Every mom needs a lunch date every once in awhile. Thank you to our neighbors over at Shannon's Deli for letting us use their space! The holidays are quickly approaching and this holiday season we want to CELEBRATE YOU!! Please join us in our first ever Paradiso Campaign! To start this campaign off we're looking for 12 REAL WOMEN to be our Celebrate You ambassadors. Any age, any size, any ethnicity, any occupation. DON'T HESITATE! Just follow the instructions below by 10/18 and we'll choose 12 amazing women! Make sure to share this with all the beautiful women you know!!! We can't wait! Good Morning! To start our week off right, we're sharing our Lily & Laura fall collection video! Make sure to stop in when we open at 10:00 am to check them out! One for $12 or three for $30. If you have been an avid Paradiso shopper then you're aware that Blessing Bracelets are a Paradiso staple! And now the collection is about to get even bigger with their newest arrival of the Mala Bead. What exactly is a Mala Bead? Mala Beads are known as prayer beads, they have been used for meditation and recitation of chants for thousands of years. Whether to keep by a bedside, or wear a mala can bring a sense of inner peace and calm. A mala is chosen by the properties of a certain stone choice or simply by an attraction to a color or design. Each of ours are hand strung with semi-precious gem stones and/or crystals and are a limited edition. Choose your Mala and wear it how you'd like; as a bracelet, a necklace or even an arm wrap, you're Mala will be there as constant reminder for you to let go and stay at ease. They're the perfect accessory to give you that little bit of reassurance each and every day and make an excellent gift for the special people in your life. Make sure to stop in and check out our Mala Bead display and choose your Mala. Every week we'll be sharing a little bit about the girls behind the boutique! And don't forget about our Labor Day sale in store this Saturday and Sunday (closed Monday) and our first Paradiso Pop Up this Monday! Have a safe and happy holiday weekend! This past August we celebrated our very first year as a store and it seems as though we will be celebrating just as many ‘firsts’ this upcoming year. So far we've launched our first website, created our first look book and even started our own blog and YouTube channel; if I didn’t know any better, I’d say we have some big things headed our way. And since we’re making note of all our ‘firsts’, why not add one more to the list. I’m pretty sure we’re all aware that pop up shops have become a craze but were taking it a step further with our own online pop up shop. What exactly is an online pop up shop? All week long our website (www.shopparadisoboutique.com) will be turned into a blog featuring posts that share our newest arrivals, how to’s and the ever so popular #ootd but then our shop will replace our blog and you will be able to purchase and recreate what we shared with you all week long for special deals! So get ready and follow along! A sneak peek at one of our raffle prizes for tomorrow's fundraiser!!! Raffle tickets are available in-store today or during tomorrow's fashion show! 1for$5 or 6for$20! A big thanks to @fringeoflombard for such a beautiful basket and every other local participating neighbor!!! You guys are incredible... @dry_tini @babcocksgrovehouse @little_shop_on_the_prairie and more!